The Manta is unique and very intuitive. It looks and feels great and is a joy to use. Unique design and interface. Highly portable and USB-powered. Huge potential as an expressive instrument. Not a mixing controller. Not plug 'n' play. The Manta has an array of 48 hexagonal sensors. As a general rule of thumb, there are two types of MIDI controller in the world. There are the meat 'n' potatoes mass-produced keyboards and surfaces with knobs on - where you can pretty much tell what they do by looking at them - and there are more esoteric creations, such as the JazzMutant Lemur and Percussa's AudioCubes, where you have to dig a little deeper to figure them out. Now, take a look at the photo above and see if you can guess which category the Snyderphonics Instruments Manta falls into? The Manta's slimline wooden case makes it one of the flattest and lightest controllers around - slip it into the included black and green padded sleeve, pack it with your laptop, and you can carry this with you wherever you go. The only physical connection is a mini-USB jack on the rear end. That's good news, because buss power is great for mobile musicians. 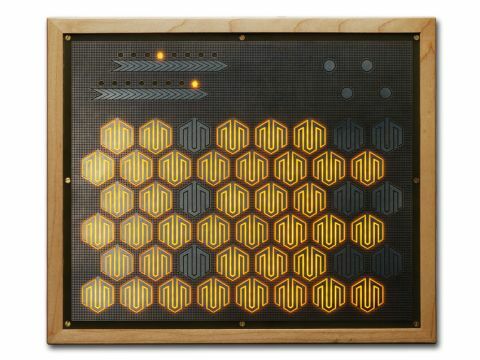 The surface is covered with touch-sensitive controls - 48 hexagonal sensors, eight buttons, and two faders, etched into a metal grid. Below that are 68 warm orange LEDs. "The Manta's slimline wooden case makes it one of the flattest and lightest controllers around"
The Manta uses either OSC or MIDI to communicate with software, allowing it to interact with almost any music application - Supercollider, Max/MSP, Live, Reason, Logic, Cubase and so on - but it won't do anything until you install the Max/MSP patches it needs, and of course to do that you've got to install the free Max Runtime application, or the full version of Max/ MSP. There's also a basic standalone MIDI routing application, but you'll get much better results using the Max/MSP elements. The Max/MSP router includes an editor window, where MIDI notes and CCs (continuous controllers) can be assigned to each control. There are also a couple of presets included, and it was easy to get the Manta sending MIDI to Ableton Live. Immediately, the Manta feels more like an instrument interface than it does a 'controller' - it's no mixer substitute. Playing chords into Live's Operator synth feels surprisingly natural, and although the default patch creates a 'normal' three-octave layout, the unusual arrangement of the notes makes it great for busting bad keyboard habits. It's also great for sweeping fingers across the sensors to create glissando/ harp effects, and the velocity sensitivity makes for a truly expressive feel. Sometimes, the Manta feels more like a two-handed tapping instrument than a keyboard, and it might be worthwhile experimenting with different tunings based on those instruments. The flat surface throws back to old-school instruments with 'flat' keyboards, such as the EDP Wasp, the Stylophone, and the Electro-Harmonix Mini Synth. We used the buttons to toggle audio effects on and off, and the sliders to control effect send levels. We also applied Live's MIDI effects to the input, as a way of filtering or re-routing the incoming notes without having to spend too long in the Max/MSP environment. "Because of the flat surface, the Manta does need you to pay attention to it - it's hard to tell where your fingers are going if you're not looking at it." Moving on from Live, the Manta plays nicely with Logic's ES2 synth on a monophonic patch with glissando, and the Manta sliders controlling effects parameters. Of course, it can be used with VJ applications too, although somehow it didn't seem a good fit when we ran it with Arkaos VJ. Because of the flat surface, the Manta does need you to pay attention to it - it's hard to tell where your fingers are going if you're not looking at it. Beyond simply sending notes and responding to velocity, the sensors can send MIDI CCs, with values based on how much of the surface area of the sensor is being pressed on; a larger contact area gives a higher controller value. This adds another dimension to the sensitivity possible with the Manta; it could be used for filtering, or panning, or loading different chains within Live instrument racks or, well, anything, on an individual note basis. The sensors can also be aggregated to form one giant XY touchpad, where X and Y have specific values, and sensor pressure has another. It's deep! The Manta looks cool, is portable, and feels like an instrument - it's the pressure-to-CC function that makes the difference. Put this next to a more traditional controller to get the best of both worlds: Live users should try it alongside the Akai APC40, and users of other DAWs should put it next to their keyboards or mixers. A great example of what's possible is Vlad Spear's user-created patch - called Honeycomb - that's already up there and being shared through the Manta user forum. This is based on Leonhard Euler's tone network system, which creates some cool chord layouts. Vlad uses both a Manta and a monome, dividing 'melodic' and 'rhythmic' tasks between them - that's a lot of flashing lights and bespoke wood. The Manta's in limited production at the moment, so if you're interested, we recommend that you get a move on. There's no question that Snyderphonics' pretty box makes a great synth front-end; this is one of the most responsive and generally awesome synth controllers we've used. Our order's in already.